Meet the team who will help to make your design dreams a reality! Sonya Watsham (R) – Managing Director with over 20 experience in the stone industry. 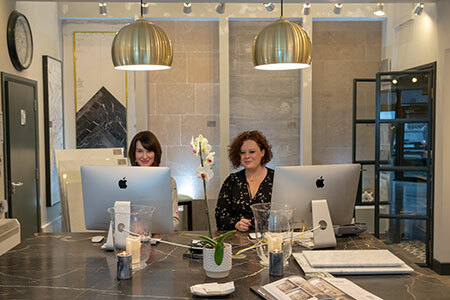 She, along with David Kearns – who is a little camera shy – opened Fossil Stone Specialist doors almost four years ago, and haven’t looked back! Nichola Hunter(L) – Sales & Design.